The first response came from ICTJ’s Activities Coordinator in Tunisia Wahid Ferchichi who narrated his experience as a member of the national independent fact-finding commission on corruption that was formed in Tunisia. The commission was formed by Ben Ali on January 14, which coincided with the beginning of the revolution. However, that commission was not a truth commission but a fact-finding one and not entitled to announce its findings at the end of the mandate. It was only entitled to investigate and hand over to the judiciary any files it found suspicious. Ferchichi stressed that anybody accused would remain innocent until proved guilty. Ferchichi also explained the two draft laws proposed by the commission: a law on reparations for those affected by corruption and a law on the protection of witnesses. The law on reparations in cases of corruption proposes forming a council to monitor corruption and issue appropriate measures. “We cannot eliminate corruption,” he said, “but we can limit it.” We need to from the commission’s mistakes, stressed Ferchichi, noting that one of the major problems it faced was the lack of understanding of transitional justice. He added that there was a fear of this commission among judges and lawyers who previously criticized its work, as the commission was allocated powers usually given to investigators. 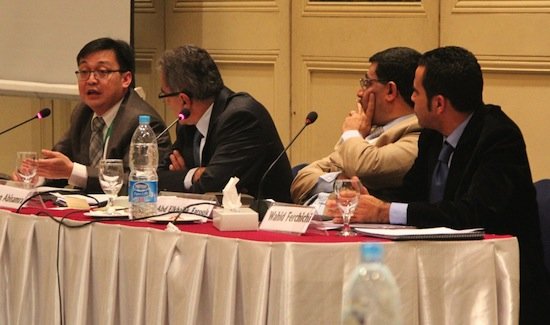 Egyptian economic and strategic expert Abd Elkhalek Farouk emphasized the distinction between bribery and theft of public funds. He then listed the various forms of corruption in state institutions ranging from policies that corrupt the institutions, the parliament and the judiciary to creating private funds to which large sums of public money are funneled. Farouk discussed in detail the roots of corruption practices citing the appointments of parliamentarians close to those in power; privileges to major funders of the party; close relations with the security sector and intelligence services. Farouk touched on the various laws and amendments that encouraged corruption in Egypt and opened the space for further deals at the expense of the state. ICTJ’s Director of Reparations Program Ruben Carranza then focused on linking fighting corruption and economic crimes to transitional justice approaches noting the difficulty of prosecuting corruption. Citing how 680 million dollars were returned to the Philippines following the fall of Marcos’ regime, Carranza said that dictatorships in countries like Tunisia and Egypt reinforced their impunity by linking human rights violations and corruption. “In some countries there have been attempts to use mechanisms of transitional justice such as truth seeking and prosecution to address corruption,” he said. Carranza then distinguished between the various truth commissions, noting that they sometimes exclude corruption like in South Africa and Chile arguing that this might result in losing an opportunity that later cannot be recovered. In Chile for example, the truth commission did not investigate corruption and subsequent Pinochet’s sickness and death did prevented his prosecution. On the other hand, in countries like Bangladesh, the truth-seeking commission only focused on corruption and did not consider HR violations. According to Carranza, it is difficult to judge the positive outcomes of giving amnesties for large scale corruption in order to recover the assets. Carranza also mentioned the rigorously and fairly decided case of Switzerland where assets were obtained from corruption. “You need a court to render the judgment, but what if your court system does not function at all?” he asked. Carranza finally focused on the experiences where recovered assets were used as reparations, citing the example of Philippines where $US200 million of the $US680 million recovered were used as reparations. The next session of the conference allowed discussions on the International Criminal Court, and on strengthening the Rule of Law in the Middle East and North Africa region.